What great news for our soccer boys! DC United midfielder Dwayne De Rosario has been picked, for the seventh time, to play for the 2012 MLS All-Star game on July 25 against Chelsea FC. DC United forward Chris Pontius made the team, too. This is his first year. DC United legend/current coach, Ben Olsen, will be the coach for the All-Star team! Olsen, 35, played for DC United for 12 seasons and retired in 2009. He joined the MLS again in January 2010, this time as an assistant coach for DC United. 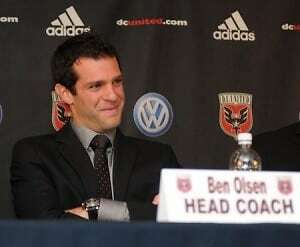 He became head coach for DC United in November 2010. To go from playing, to coaching the All-Star team, in just three years is impressive. Other tapped teammates include midfielder David Beckham from LA Galaxy, and the highest paid player in the MLS, forward Thierry Henry of the New York Red Bulls. Some teams in the MLS have no representation in the All-Star roster, while San Jose Earthquakes and Sporting Kansas City are each sending three players. The All-Star MLS game used to pit the East and West MLS Soccer conferences against each other, but has evolved to the current system, which features one team abroad playing against one league All-Star team. Last year's opponent was Manchester United. The MLS All-Stars have not won a game since 2008.